"What about 'Bella- does that sound fun?" It was a rainy Sunday, our family calendar laid out in usual fashion, multitudes of colors streaking across the pages as we plotted our daily lives. This time there was a new agenda item we needed a spot for - L's first play date. For most kids, "play date" is a regular term, one that comes naturally for a family and is desired by the child. And while our oldest lives and breathes by his social circle, and navigates it seamlessly, preparing and executing on one for our youngest is a bit of a dance and an art. Even trickier? He's not into it nor motivated to have one. But when doctor's orders call, parents listen. 1. Invite a member of the tribe. Start with a family where you adore the parents and know they have an inclusive, kind, patient child. 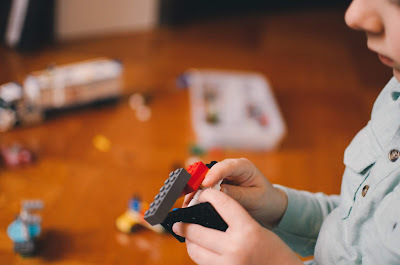 It's also helpful if they have a bit of history on your child, as they can be supportive when things get awkward or you break out some of your tools to help the kids navigate their play date. Plus no judgement and less stress for everyone. Give your child some choice in the matter too, guiding them through a list of names to invite so they feel empowered to choose a peer they enjoy. We started with one of my best friends and her daughter, who happens to have been a peer model in a school before. Her mama seamlessly transitioned from basement to family room, outside to kitchen, not blinking an eye when we sat on tiny chairs, sprawled on the floor, were interrupted 10 million times, and shared secret giggles in the socially awkward moments. She nor her daughter missed a beat, and their participation in this milestone event was a greater gift than they can ever know. 2. Choose a location your child is comfortable with. Before you offer your kiddo a choice, think of where he does best. Is it in a park with open space? At home with is toys and supports? At someone else's home where things are new? At a trampoline or play place? Think through if his peer likes those places too, then give your child two places to select from. A week in advance, keep talking about the place casually and introduce the positive experiences they can have there. 3. Prepare your child. Several days before the play date, start talking with your kiddo on what the day can look like, how long it will last, and some of the activities they may choose to do. Select some favorite snacks to have on hand so when they need a break or your child needs some regulation, an invitation to the table for munching is always available. On the day of the play date, regulate your child by doing heavy work, meditation, swinging, etc. so that when their friend arrives, their mind and body feel centered and ready. For those on picture schedules, consider having an app or menu nearby so transitioning from activity to activity for the kids can be a bit easier. If you have other kids, consider having them visit their grandparents or play with the neighbors so you can focus on your other child and this playdate. 4. Make sure you have energy, patience and tools. Facilitating the play date will take some attention and require you to be "on." While you're used to managing your child's unique needs day to day and advocating for him at school, having a friend over can feel like a very focused and intense few hours. Make sure it's a day that's not already stacked with too many activities, that you've gotten some rest and water, and you're in the right mind frame. Have the many tools you've learned form your child's caregivers rehearsed and in your back pocket to bust out if you need it. Maybe even have a glass of wine and face mask on hand for after the event. 5. Give freedom, but facilitate. Observe how the kids are doing and help facilitate where your child may need it. Does your child want to play in the basement with his pal but have you for comfort nearby? Then tuck yourselves in the corner and catch up with the other parent, casually catching conversation here and there and intervening with positivity when the kids may need it. For example, this mama and I and were enjoying chatting when I noticed her daughter kept asking to "play house." Mine kept walking in circles and avoiding her and playing cars only and ignoring her because he doesn't understand what that means or what it looks like, therefore shutting him down. A casual "Hey L - playing house usually means x. Is that what you'd like him to do A? Does that sound fun L?" Then returning to adult conversation. Provide them choice and autonomy, but recognize where your child may need some clarity or support socially. Their play mate likely doesn't understand why they are or are not responding in an atypical way, and you can help with that without being too invasive. 6. Make it comfortable for the parents, too. Just be yourself and fold them into what is your day-to-day life that may look different than theirs. Act like it's a coffee date the two of you made and enjoy the time you have together to catch up. Be a good hostess, have yummy drinks and snacks on hand, and be approachable for whatever they or their child may need. 7. Be flexible. Avoid getting too attached to any plan or expectations you had of the playdate. Did you have building a fairy garden on the list and it's raining? Move to plan B. Are the children not engaging well? Try plan C. Need to end early because one is tired or hungry? That's ok - there is always next time. Go in with an open mind and take the pressure off so everyone can enjoy. 8. Praise your child during and after. Remember that what your child is doing is hard work. Check in by making eye contact, offering smiles and thanking and praising him for how his social time is going. Afterward talk at his level about what went well, how he enjoyed it and what he'd like to happen next time. If he's into hugging, give him a big ol' one. 9. Recover. Kick off your shoes, let your child engage in a rewarding activity or do some more regulatory work to help him recover after a play date. A reset sets him up for the rest of the day and start fresh the next one. 10. Celebrate the milestones, small wins and even failures. After all the chaos and fun, take a quiet moment to reflect by yourself on how you're helping your child, all he accomplished and the quality time you may have gotten in with a friend. Remember that even a small smile, eye contact, greeting or asking a question is a milestone for your atypical child and a moment to be celebrated. Now go on, go ahead. Take that next play date and make happy!